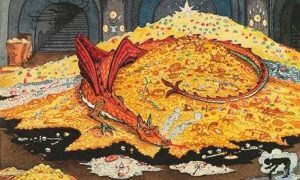 I’ve just written an article on common ways movies, TV, and comics mess up dragons, but there’s one I never got to – the Chiefest and Greatest of Calamities, that most specially greedy, strong and wicked worm, SMAUG! This one, as redesigned for the movie (WHY?!?) was especially messed up. I kept trying to imagine what would happen when they designed a dragon. Then they did, and it was… meh. It was bland. It was dull. It was neither hot nor cold, so I spit it from my mouth. Pallid and unremarkable. Sure, it’s a dragon, but that’s all I can say about it. The colour matches the Tolkien drawing above – but look at the one at the bottom of this article. So why did the movie version only have four? I said in the last article that I don’t necessarily think it looks uncool to have a four-limbed dragon. (Reign of Fire, Dragonslayer) And yet, he just looks clumsy and useless during the attack on Laketown. It just doesn’t even look good here. In my last article, I also said you could make a dragon any colour you like. I stand by that – if it’s an original dragon. Or, if it’s based on one where we don’t know the colour (in the first How To Train Your Dragon book, Cressida Cowell never tells us Toothless’s colour – though it’s narrowed down to a small range). Neither of those apply here. 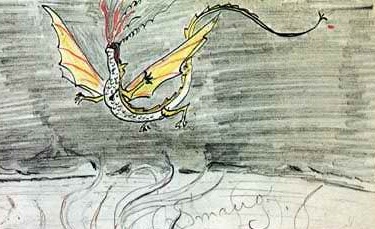 Conversation With Smaug by J.R.R. Tolkien, detail. Smaug is red. Or, more accurately, red-gold. Those who’ve read the book (which apparently doesn’t include the film-makers, and not just because of Smaug) know this. So why did they make him lapis? Answer: The Hobbit movies fell very much under Hollywood’s orange-teal obsession. Worse, like his limbs, they teased us with it. We caught tiny glimpses of him; an eye here, a leg there, and they were clearly and properly red. In fact, if you watch The Desolation Of Smaug carefully, you can see the scene where he changes colour – he’s talking to Bilbo, and he’s red, as he should be. We cut away to another scene, then cut back. 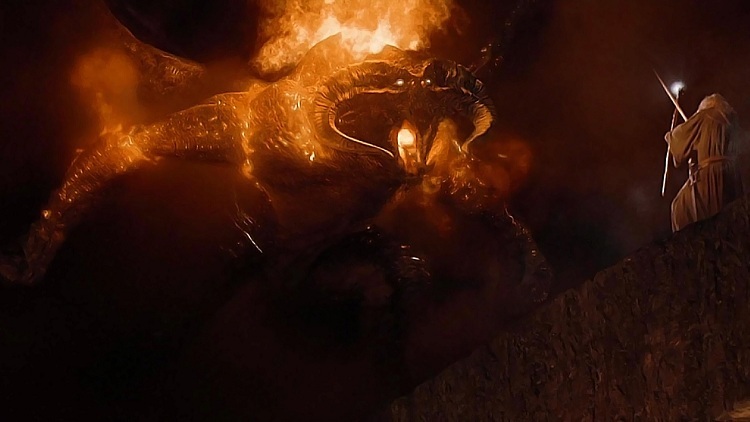 The lighting, the time of day, the angle, Smaug’s position – nothing has changed. Except now he’s lapis. The movie version of Smaug was his own level of wrong, on multiple levels.